Clowning Around is a little bit of fun and a little bit of brains too! Some of the clown’s tricks need logic. In this game, you make your clown drop the ball in any column. But you also have to make sure that you get five balls in a row, and beat your opponent! 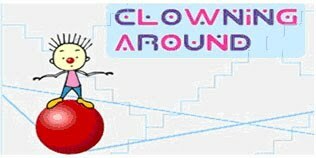 Guide your clown along the high wire and click on the column you want to drop the ball in. The objective is to get 5 balls in a row whether vertical, horizontal or diagonal.